Galveston Seawall Beach with Hotels and Vacation Rentals. 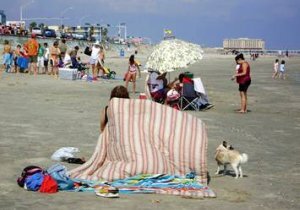 Galveston Seawall beach is the closest beach to Galveston hotels and beachfront vacation rental homes. The beach is between the 10th-61st street on the Galveston seawall boulevard. It stretches from the East side just after the Stewart beach to almost the west end of the wall. Its closeness to the seawall makes it an attractive spot for vacationers. People play at the beach while vehicles drive by at close range on the wall. Hotels like San Luis, Hotel Galvez, Holiday Inn, Comfort Inn and best value hotels are very close to the seawall. Many restaurants line up the seawall. This is very convenient for beach lovers. Some people are able to park close to the beach on the seawall. One has to be there early to get a parking space. Vehicle are not allowed on the the beach. Coming to Galveston for vacation? Do you prefer to pack close to the seawall? Do you want a beach not too crowded? Then consider the seawall beach and hotels. It's best for strolling, undisturbed sunbathing and other quieter activities. For those interested in Galveston Texas cruise, it will be nice to experience the beach in Galveston first before going on a cruise. This will show how comparable the Galveston beaches are to those of the Caribbean. 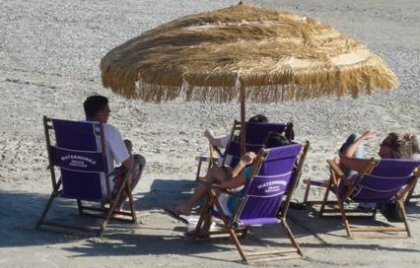 Umbrella, boogie board and chair rental available. Surfboard rentals available at some locations. There are Port-o-let toilets at various locations along Seawall. Permit surfboards, wind and kite surfers, hard-bottomed boogie boards, and other hard-bottomed craft are allowed between the Flagship pier and 53rd street during the summer months. There is a designated boat launch at 29th and Seawall. Lifeguards available at locations from Memorial Day weekend through Labor Day weekend.